This Spring I've really been enjoying taking a seasonal twist on classic monochrome by adding blue denim into the mix. I think it freshens things up a bit and creates a more relaxed look with some subtle colour. This black, white and blue look was created with a few of my go to wardrobe newbies like the bargain £5 (That's right, £5!) 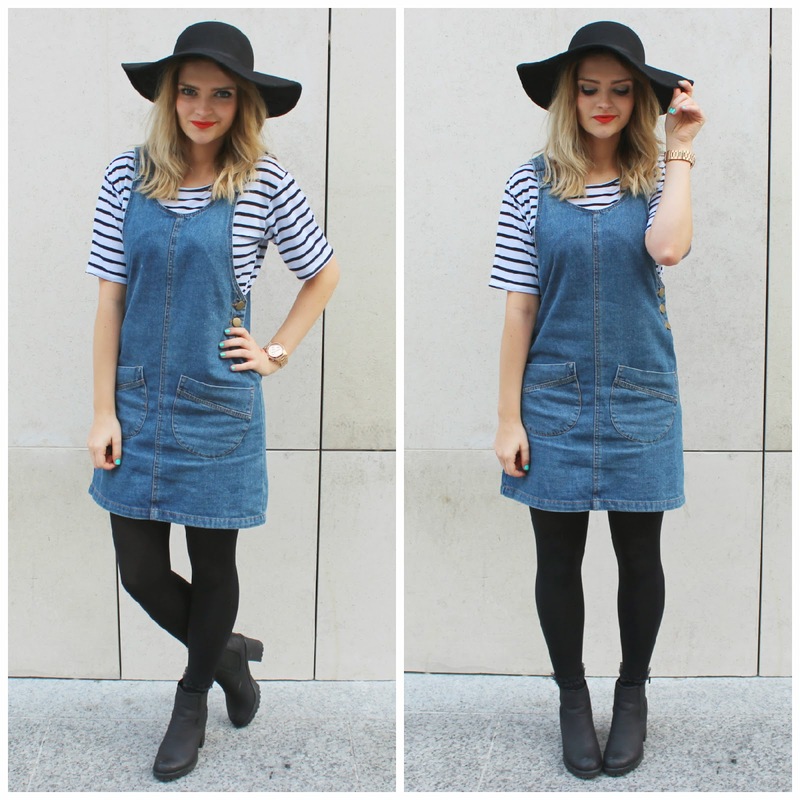 Primark pinafore- this makes me feel like a proper 90's kid and is such a fun item to style with different tops underneath like my New Look striped staple. Even though this can be a super casual look, I thought I'd dress things up a bit with my BooHoo chelsea boots, bright lips/nails and Topshop floppy hat which makes me feel like I'm from Made in Chelsea (always the dream). The hat is actually one of the items I bought during my video shoot shopping challenge at Westfield London on Wednesday which was so amazing, but they'll be lots more about all that in my vlog and photos of the day coming very soon. With the shoot last week and a big birthday night out in London for one of my uni besties last night I can't tell you how much I'm enjoying a chilled night in with Britain's Got Talent and plenty of tea right now... I'm also planning a big giveaway that's launching on my blog tomorrow so stay tuned for that! Are you a fan of the black, white & blue? Bye & a great new week! Cute outfit! I really like the hat, I always pass them in Topshop but I might have to try them on next time!